Calling all anglers. Are you tired of that 9 to 5 job? Do you watch those Saturday fishing shows and say to yourself, “I could do that.” I mean how hard could it be? You go out with a few guys (or gals, no special man-type skills or strength needed here) fish all day, collect the big bucks and celebrate with a few brewskis afterwards. You could get some sponsors and wear those neat shirts with all the patches on them or get a boat all decked out with sponsor logos. We are camped in our RV for the summer on these really nice New Hampshire lakes. They are occasionally taken over by local bass tournaments. Dozens of boats running from place to place, looking for that secret hot spot that will produce the winner. We try and use our road travel as a way to expand our knowledge, so we headed to the marina for the weigh-in and to see what we could learn. It was informative. 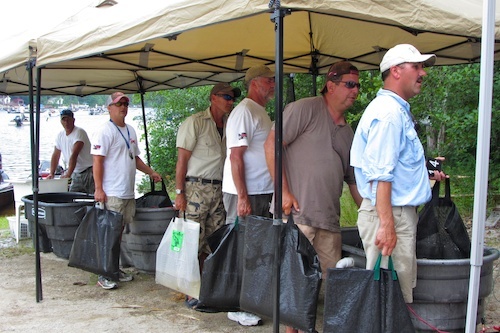 There were 50 boats with 2-man teams who had to catch up to 8 fish. The fish had to be alive when brought in at the tournaments end. 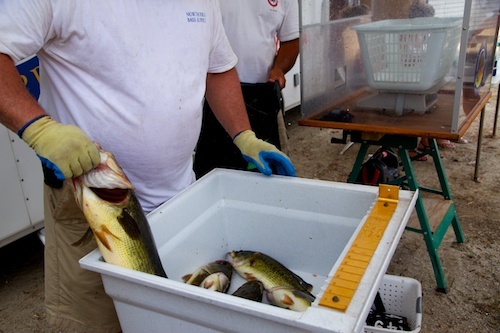 They (the fish) would be weighed and the team with the highest total weight would win. Here’s how it went. The boats all came in at three o’clock. Since they were trying to be orderly only 10 or so weighed in at one time. There was a lot of circling around the marina going on by the boats as they waited. Some teams were still casting out under the docks, one assumes they didn’t have their 8 fish yet and were making good use of the down time. When it’s your turn, you carry your live catch up to the weigh-in station in these nifty fish carriers. First thing you do is transfer the fish from your carrier to specially provided mesh bags to keep the fish alive while you wait in line. 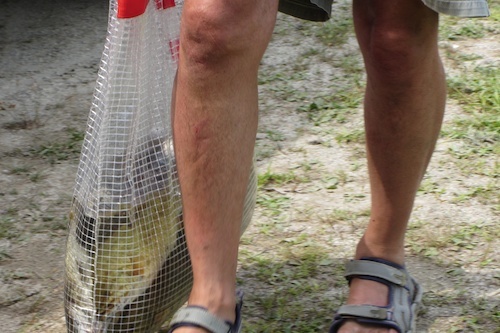 While in line you move your fish, in their mesh bag, from aeration tank to aeration tank as you move forward. At this point there is much discussion of the weights being announced, the difficulty of the fishing because of A) the water temperature, B) the fish not wanting to eat, C) the lunar phase (pick one) and, of course, the one that got away. When it is your turn your catch is dumped out, sorted through, check for a pulse and finally weighed. 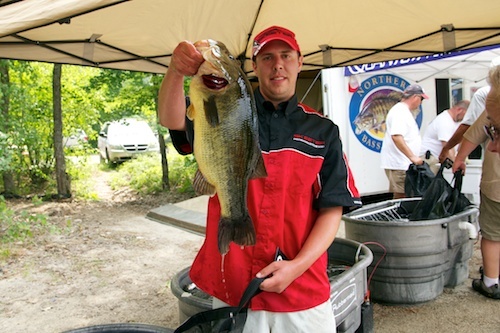 Your largest fish is weighed separately (affectionately called a lunker) because there were prizes for largest single fish as well as total weight. All results are logged in on the tally board. Here we heard reasons why (AKA excuses) some participants came in with zero or one fish. Actually the fishing was difficult, only six boats of 50 caught the 8 fish limit. It had been hot and we all know when the water heats up the fish don’t bite. Of course the winner had no problems with the water temperature. He had 8 fish weighing just over 24 pounds including this 6.61 pound large mouth. I tried to find out a general idea of the prize money and I heard that after entry fees and boat expenses it isn’t enough. I heard about accumulating points to go on to Regional, State and National Level tournaments. What I didn’t hear was anyone saying that they had had enough. 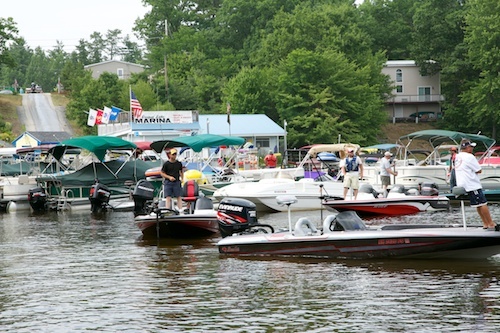 Instead, as they packed up and hauled their boats out, I heard it would be better at the next tournament. I guess that’s what you really need if you want to quit your day job and work your way up through this circuit to join the Pro Bass tour…a lot of optimism. For decades I’ve vowed that, “when I get old I’m gonna learn to tie flies and walk the streams river fishin'” but this lake is gorgeous and may have altered that vow. Lovely post! Thank you. There are all sorts of roads to follow, I recommend trying several until you find one you like. I agree, you against the fish…except the fish seems to win a lot. I live down in Florida and we have a FLW Pro Bass fishing tournament in my town. The top prize is $100K in cash and prizes! 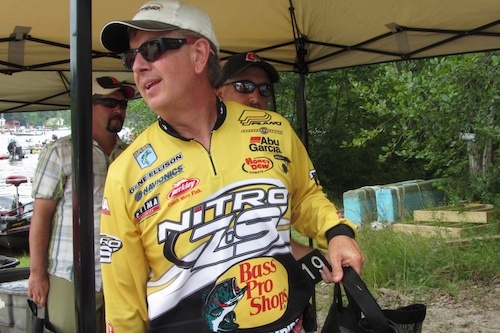 We also have two pro fishermen – one being Terry ‘Big Show’ Scroggins – who are from my town. The tournament buzz and excitement is great! 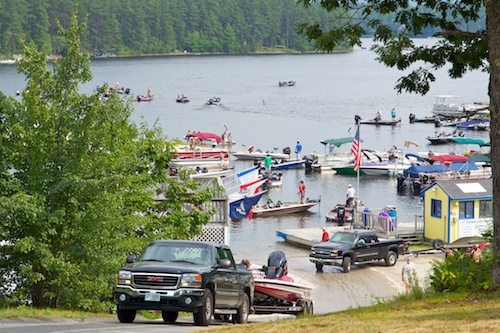 It was our first official type event and even at this low level of Lake Ossipee it was fun. Don’t think these guys were in the 100k levels.